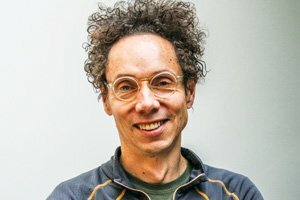 Even if you’re not one of the millions who’ve cracked his books, read his articles, tuned into his podcast, or listened to his talks, you’re still probably aware of Malcolm Gladwell as someone who’s carved out a distinctive cultural niche as a kind of entrepreneur of challenging perspectives and intellectual adventure stories. In recent years, he’s evolved from being just a wildly successful author to becoming a seemingly nonstop, multiplatform purveyor of striking, counterintuitive ideas. His work pivots on a kind of conjury, a flair for mesmerizing audiences into rediscovering the familiar and thinking about it in surprising, often fascinating new ways. There’ve been the five bestsellers: the Big Idea books The Tipping Point, Blink, Outliers, and David and Goliath; along with What the Dog Saw, a selection of essays pulled from his more than 20 years of writing for The New Yorker. And now we have three seasons of him looking anew at the past in his entertaining podcast, Revisionist History, which debuted at number one on iTunes. Named one of Time magazine’s 100 most influential people, Gladwell has tallied more than 14 million views for his TED talks, and somewhere in his West Village apartment is a ribboned medallion bestowed upon him by Queen Elizabeth’s Canadian rep for being the kind of shining example of a human being who’s awarded membership in the Order of Canada. Come March, he’ll be a keynoter at the 2019 Psychotherapy Networker Symposium. Gladwell’s signature style—weaving story with theory and research that alters our standard take on how human beings actually behave and how the world really works—has had such an impact that it’s become its own adjective: Gladwellian ideas and insights upend widely accepted presumptions that most of us never think to question. It’s Gladwell who made pervasive the idea that an abundance of talent or intellect is less a defining characteristic of virtuosity than a gifted musician’s or a computer genius’s willingness to put in 10,000 hours of practice. Then there’s the chapter in Outliers, based on some previously obscure study, that revealed the connection between age cutoff deadlines for Canadian youth hockey league players and their later athletic success. With his flair for explaining otherwise dull and complex scientific findings, Gladwell showed that the oldest boys within a given age category had such a significant developmental edge over their younger peers that they eventually comprised the bulk of the winningest teams. Through Gladwell’s deft repackaging, an academic researcher’s otherwise ignored work has led to the growing popularity of “redshirting” at school enrollment time, as countless parents hold children on the younger end of age requirements back in hopes of giving them a leg up. With his characteristic self-deprecation, Gladwell claims that the best way to describe what he does is to serve as a “parasite,” translating the ever-burgeoning mass of psychosocial academic thought into engaging stories for the general public. However you categorize him, his work has earned him a presidential citation from the American Psychological Association for his success in boosting the field. While little-known research by social psychologists and behavioral scientists is his favorite source material, psychotherapists have occasionally attracted his attention. In the first chapter of Blink, he included the work of couples researcher and therapist John Gottman on predicting marriage success to help elucidate how our snap judgements can be uncannily on target. In the memorable closer for the last season of his Revisionist History podcast, he interviewed psychotherapist Michele Press, president of the New York Analytic Society and Institute, about the concept of parapraxis, or the “Freudian slip.” Giving the conversation its special Gladwellian twist is how he illustrates the arcane topic with Elvis Presley’s repeated inability to get through “Are You Lonesome Tonight?”—a song he wrote about his ex-wife, Priscilla—without laughing. A Canadian born in the UK to a British mathematician father and a Jamaican social worker mother, Gladwell plays his role as thought leader outside the US as well as within it. The Guardian insists that he’s responsible not only for the seminal impact of his own material, but also for the invasion, on both sides of the pond, of the “pop-idea genre” exemplified in platforms like TED talks, Big Think, and Brain Pickings. But if he’s now acknowledged for his ability to shape the global conversation, true to his Canadian heritage, he seems determined not to fall victim to the cardinal sin of ponderous self-importance. There’s a buoyancy to his intellectual style and public persona, an almost boyish enthusiasm for the striking discoveries he translates for the rest of us in his work. It helps his brand that he seems to physically embody lightness and youthful energy. A lifelong runner, who’s maintained a teenage physicality and a preference for sometimes rumpled, often untucked oxford shirts, he’s got the look of an eccentrically brainy college kid who’s given to forgetting to eat and falling asleep in his library cubby. He’s always careful to pay due deference to the superior wisdom of his “elders,” the researchers whose academic contributions he brings to life for his vast audience—a talent he offhandedly dismisses. In fact, a number of Gladwell’s early website posts are devoted to back-and-forths with critics, whose primary complaint appeared to be that by popularizing research to support an entertaining narrative Gladwell was flying in the face of academic standards and oversimplifying complicated truths. The site’s main page also includes a cheeky photo of his 14-year-old self, neck and neck at the finish line of a track, with a boy who would go on to become Canada’s best miler. With a rare display of immodesty, Gladwell points out that he, in fact, won that particular race. Part of what makes Gladwell’s books unique is his talent for making the painstaking behind-the-scenes work of research so accessible. John Gottman and the functioning of The Gottman Institute were captured in such a way in Blink, an exploration of what underlies our unconscious or split-second decision-making. Gladwell wanted to illustrate the psychological concept of “thin-slicing,” the ability to make immediate judgments based on recognizable patterns. So he spent time in Gottman’s lab, as Gottman and his staff coded emotional expressions and dialogue and made predictions in the space of a single, filmed interaction about whether a couple was destined to stay together or break up. When he was six, Gladwell’s family left England for Canada. His late father became a math professor at the University of Waterloo, and his mother, Joyce, who saw a need for mental health services in the small town a few miles from campus where the Gladwells lived, helped found a mental health center, and then got her MSW and became a therapist. His parents’ disparities also seem to have influenced his career path. Though his father advised him never to become a journalist—work he associated with a penchant for the salacious found in many of Britain’s tabloids and magazines—Gladwell was fascinated by his dad’s professional life. The younger Gladwell reveled in going to the university and losing hours among the library’s stacks. He’s said that the peculiar amount of time he now spends embedded with researchers and articulating their work may represent his continued pursuit of understanding his beloved but ultimately unknowable, academic dad. Mother Joyce is also a writer, who was born into a family of teachers in a parish in the middle of Jamaica. In Outliers, Gladwell devotes a chapter to the lucky mingling of events, as well as the learnedness and doggedness of her deeply religious parents, that led to his mother’s private school education. In her book, Brown Face, Big Master, Joyce wrestles with God (Big Master) about racism and her own relative privilege as a light-skinned woman of color, after a London landlady realizes she’s Jamaican and throws her and her white husband out of their flat. Psychotherapy Networker: You’ve written extensively about psychology but very little about psychotherapy or mental health issues like depression or anxiety. Is there some reason that those subjects haven’t attracted your attention? Malcolm Gladwell: The truth is that early on in my career as a writer, I made the mistake of reading Janet Malcolm’s book on psychoanalysis, The Impossible Profession, which I regard as a masterpiece, same as almost all her books. After reading it, I knew I could never ever write as intelligently about therapy as she did. Imagine you were a budding tennis player and happened to play a junior tournament against a young Roger Federer: you would’ve probably quit tennis. So after reading Janet Malcolm on psychoanalysis, it was the same thing. I said to myself, I’ll probably have to focus elsewhere. But I’m not uninterested in the topic. In fact, I have a chapter in my new book about suicide, and that’s one of the reasons I’m looking forward to speaking at the Networker Symposium. I think it will be a great chance to test out some of my ideas on the subject with a group of mental health professionals. PN: Despite your extraordinary success, you like to refer to yourself as a kind of journalistic parasite. What do you mean by that? Gladwell: Parasites often perform very valuable functions. There’s a little bird that lives on the back of elephants who picks off the fleas. Those little birds make the elephant’s life better, but they require the presence of the elephant for their livelihood. That’s not a bad analogy for what I do. I require a large body of academic thought; that’s my elephant. If that’s not there, I don’t exist. I’m not a primary generator of ideas. I take other people’s ideas and try to reexplain and repackage them for the benefit of a broader audience. I’m proud of serving that parasitical and intermediary function, but I never confuse myself with the person who came up with the ideas in the first place. PN: How do you assess the impact that your work has had on the psychology community? Gladwell: That’s an almost impossible question to answer. I’d like to think that I’ve given some good ideas—and maybe sometimes some bad ones—a little more visibility. But I think the most important thing I’ve done is to point people, especially young people, in the direction of psychology. When an academic says, “I used your book in my Introduction to Psychology class,” that, to me, is the highest possible praise. I don’t write books that should be studied by fourth-year psychology students: they might already know more than I do at that point. Really, my target audience is that bright, curious, first-year student who’s wondering what to study. And my books essentially argue that you could do a lot worse than studying psychology. When someone tells me, “Reading your books is why I majored in psychology,” I consider that my sweet spot. I’m an advertisement for the field. PN: What can you say about the book you’re working on now? Gladwell: I’m interested in encounters between strangers that go awry. A classic example is the incidents at police stops we’ve all been hearing about over the past several years. Both the police officer and the person who’s been stopped have to make judgments about each other in a very limited span of time based on very limited information. And the possibility for a mistake is very high. I want to try to understand why those mistakes happen and what we can we do to avoid them. Now if you know the cop and he knows you, the probability of things going awry are greatly reduced. But a lot of senseless violence is triggered by the fact that there’s no context in which to place the strangers we’re encountering. Or take the example of two kids who meet at a party, and something happens at the end of the night, and you wind up with a sexual assault case. I’m trying to understand situations in which we’re required to make highly consequential decisions about a stranger in a short period of time. PN: I’m sure you’re aware of the term Gladwellian as a descriptor for your work. What do you think it means? Gladwell: The short answer is I have no idea. I think what my books do is collect certain common human experiences, and help people understand and categorize those experiences in a somewhat different way. With each book, I’m saying: here’s a story, and here’s how I make sense of that story. And if the book works, people say, “Oh, I’ve experienced a similar story in my life. I like that different way of making sense of it.” I may help people organize their experience in new ways, but do I inspire them to do dramatic, earth-shaking things in response? I have no idea, but I doubt it. PN: How do you choose your themes and put together the puzzle pieces of your books? For example, what got you interested in encounters between strangers? Gladwell: Actually, the thing that got me going was my fascination with the Bernie Madoff case. I thought that was one of the most interesting public stories of my lifetime. Even though it seemed to be very different from what happens at police stops, when you think about it, it’s a similar kind of story. So many people entrusted their money to a man who was unknown to them. They were under an illusion that they knew him, but the illusion was false. I found the way he managed to obscure his true self from so many people he dealt with utterly fascinating. I also got interested in the kind of people who managed to sniff him out. Many people thought there was something off about him, then just backed away. I think that’s actually where I started. I got more and more interested in why it’s so difficult for people to understand when they’re being deceived. In other words, why are we often so gullible? There’s a brilliant psychologist named Tim Levine who’s come up with what he calls the Truth-Default Theory. He says that we’re by nature gullible and predisposed to trust people explicitly because it’s an evolutionary adaptation. It’s what enables us to build civil society and functional groups. It’s also why overturning that default trust is really hard. We’re not built to spot liars. PN: Which of your books would you consider most relevant to therapists? Gladwell: I know this sounds lame, but I’d say all of them, at least in the sense that a therapist is someone who’s curious about other people. That’s also true of journalists like me, but the difference is that therapists use that sense of curiosity to heal the people who come to them. Actually, it may be that the book I’m working on will wind up being of particular interest to therapists because it focuses on a problem they encounter every day: someone sits down in your office and—having no idea who they are—you have to make a meaningful assessment of them based on little snippets of information over a limited period of time. That’s really what my new book is about. In fact, the book is going to be called Talking to Strangers. That might not be a bad description of a therapist’s job. PN: Speaking of therapy, have you ever tried it yourself? Gladwell: Oh yeah. I was in therapy for years. I’m not currently, but I’ve tried it many times. PN: Did you find it beneficial? Gladwell: Maybe the best way to describe what was useful was something one of my therapists once said to me. She said, “If you were a baseball pitcher, and you had a problem with your arm, you’d go to an orthopedic surgeon. Because you’re someone who works with your mind, it’s appropriate that you should come to someone who’s an expert on the mind. Think of me in the same way that a baseball pitcher thinks about his surgeon.” I thought that was a useful and appropriate way of describing her value. Lauren Dockett is senior writer at the Networker. Rich Simon, PhD, is editor.